Versatility, reliability and a trusted brand are three main components that you should look for when shopping for a new vacuum cleaner. Luckily for you, the VonHaus 2 in 1 Cordless Vacuum Cleaner – 19.2V Li-Ion Upright Stick and Handheld Vacuum with Crevice Nozzle & Turbo Brush Head incorporates all three of those factors. 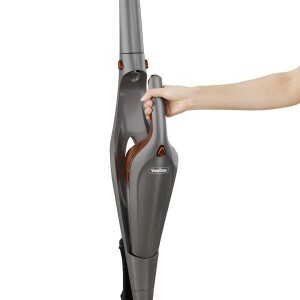 With the 2-in-1 technology, you can easily transform this vacuum from a stick to handheld. And since it is cordless, you won’t have to worry about getting tangled in a cord and can just grab it and go whenever you need to. The rechargeable battery will last up to 15 minutes on a single charge, so it is best suited for vacuuming smaller areas. The reason why this is a perfect vacuum cleaner to own is because it is handy and easy to use in case of an emergency. It’s designed to give you enough power to clean up messes and spills quickly, without having to get out a cord and get anything set up before using it. The cordless feature is convenient and the battery lasts just long enough to get a good quick cleaning done. Many people like to use this vacuum for the handheld feature and the attachments rather than for their main floor area. It can reach some of the darkest corners of your rooms and can clean stairs, and curtains and drapes quickly and easily. The dirt cup is pretty spacious and it’s easy to empty once it gets full after a few uses. 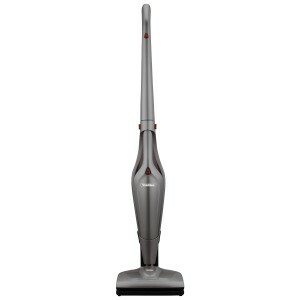 Many people have stated that this isn’t the best vacuum to own if you need a deep cleaning on your carpets. It is suitable for rugs and other shorter carpets, but it won’t be as effective on a thicker carpet. It takes about three hours to get a full charge, and then it will only last about 15 minutes when in use. It’s definitely not designed to clean your entire house. You should only expect the vacuum to be used when you need it in emergency situations or if you have areas that get dirty more quickly and just need to do a quick cleanup. There is always a mess to clean up in the house. Most of the time, your regular vacuum cleaner either isn’t what you need, or it’s too inconvenient to get out for a quick cleanup. That’s why you need to buy the VonHaus 2 in 1 Cordless Vacuum Cleaner – 19.2V Li-Ion Upright Stick and Handheld Vacuum with Crevice Nozzle & Turbo Brush Head. If you only have an upright vacuum and find yourself searching for attachments, or not having the right attachment to finish a job, then you need this vacuum to solve those problems. It is a perfect complement to any main vacuum cleaner that you currently have, so get yours on Amazon today. VonHaus takes pride as a company in manufacturing some of the highest quality vacuum cleaners in the world. The standards that they set for themselves are very high, and that is evident when they pass down quality products to their consumers. In addition to vacuum cleaners, they also manufacture equipment like tools for the outdoors, storage accessories, television accessories and other necessary tools for household use.